Why you should rescue and not support breeders or pet stores? 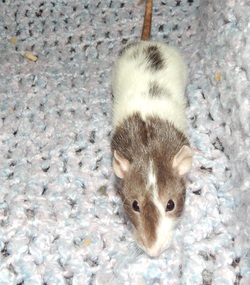 We receive numerous calls about unwanted pet rats that have been neglected or given up on. We take them in when their own owners have given up on them. We remove tumors, treat URI's, provide hospice care for those who cannot be adopted out. 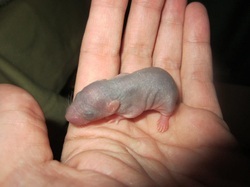 If you purchase from a pet store you may be saving that one rats life but you are opening a spot for another to fill. You are also providing demand which will keep them coming into the store. I would love to suggest a breeder but around here there are far more backyard breeders than there are good breeders. It is the same concept with the pet store. The same one who has those cute little babies probably also have rats vacuum packed in the freezer for the next meal or tucked away in a back room, alive (for now) in small containers not much bigger than a small dish pan. Is that really what you want to support? The best option is to open your home to a rescued rat, this way the spot you are opening in the rescue is so another rat can be saved. Find a rescue to get your new love from not anywhere else. Rescues depend on adoption fee's and donation to stay open. This is not an easy task to do but one we do out of love for the rats we take in. FOSTER HOMES NEEDED LOCALLY MUST BE WILLING TO BE ACTIVE IN THE RESCUE. We need homes to hold rats for 3 weeks at least and they cannot have other small animals such as Mice, Guinea pigs, or hamsters. This is not spread to other animals such as dogs or cats but it can be spread to other small rodent type pets. There are only a few things that rats can share and sadly this is generally due to rat breeding mills who do not care about the health or safety of their animals. Most of these viruses do in fact come from pet stores. If you know anyone willing to foster for 3 weeks at a time we are in need. I already had a call on two girls that need to be surrendered but I cannot take them in at this point. I live in LaPorte, IN. I love having rescued rats as pets. I have my own colony of rats but have become known as the one to call for rats in need. I personally think rats are ideal pets but not a pet for everyone. I generally have adoptable rats but I also end up being a "forever" home for the ones who are chronic ill, unsocial or tumor ridden. Rats make wonderful pets for a family. It is very important to understand a few key things about pet rats. 1. Rats love company and not just human company but company of other rats. 2. Rats have to be introduced to other rats slowly not just tossed in a cage. 3. Rats may require vet care sadly they have been so poorly bred in most cases their bodies will give up before their will does. 4. Rats will love you till the day they die. They only ask that you do the same. A few things to take note of. I work extremely long hours so being able to go through adoption applications may take some time. This is not and will not be an over night thing. I have about 3 hours each night after work to do what I have to. Remember I have to eat, clean, and take care of rats so it will take time. We also will not do adoptions through the week generally it is on my days off which are on weekends. My first priority is and always will be taking care of the rats first, they get the time I do have. So your patience is greatly appreciated. We could use a few good foster homes to allow rats to stay for 3 weeks or so at a time. It is better to not have rats or small animals. I would provide the cage, food and any medical treatment that is needed. We just need a safe house to hold them through a quarantine period which is 3 weeks at least. This allows us to be sure that the rats do not have deadly viruses such as Sendai or SDA. For more information please send us an email. We are not currently accepting surrenders.